In Lima, our proudly chauvinistic restaurant guide was Guillermo Ferreyros, whose prestige Pisco carries his name in Peru but is labelled Pisco100 here for those of us who cannot roll our ‘Rs’. This clear spirit is made from the fresh must of blended grapes from the Inca region that, alas, are not good enough for wine but are perfect for this alcohol the Peruvians favor. I asked Guillermo to send me his recipes. 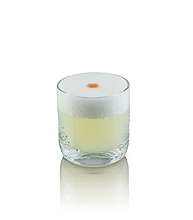 In a shaker with 5 large ice cubes (not crushed ice), combine liquids (except bitters) adding egg white last. Shake vigorously for about 15-20 seconds. Strain into a six ounce rocks glass. Garnish with one drop of Angostura and serve. Combine liquids in a shaker with 5 large ice cubes (not crushed ice). Shake vigorously about 20 seconds. 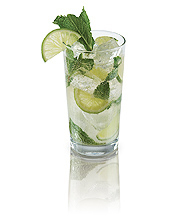 Strain into a tall six ounce glass and garnish with fresh or dried pineapple triangle and a sprig of mint.